Portrait of the artist by Cornelis DeVos (1585-1651). He was an artist of some standing in the 17th century school of Flemish portrait painting. 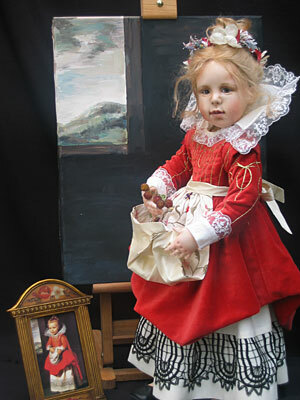 This picture of his daughter exemplifies the sympathy with which he painted his subjects. 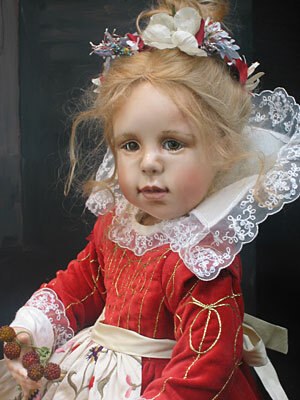 This doll has captured the same sweetness as the original child in the painting. Her costume is an amazing replica of the original. 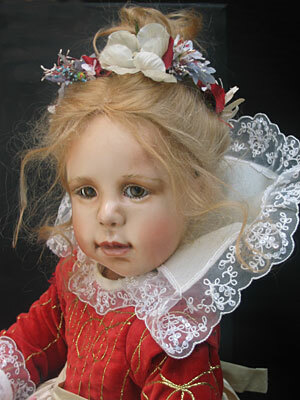 This charming child is dressed in a striking party dress of burgundy and rust silk with a delicate beaded overlay and uniquely beaded booties. Tiffany sweetly sits holding her party favor waiting for the fun to begin.